Loose skin is a problem that occurs after a significant amount of weight loss. Excess skin removal is a type of surgery that helps to correct this issue by removing the excessive skin and fat that remains. This problem is typical in those who have been overweight for many years, or are older and their body has difficulty returning to its normal size. 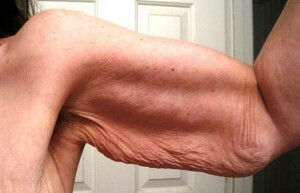 The skin and underlying tissue does not return to its original size after dramatic weight loss. Innovation to skin removal surgeries have produced aesthetically pleasing and desired results in patients. The cost of excess skin removal surgery varies greatly. The location of the facility, the reputation of the doctor and the scope of the surgery will all affect the price. If the patient is combining more than one procedure the cost will be higher. Excess skin removal is generally not covered by medical insurance because it is considered to be a cosmetic fix. The average cost of the procedure ranges from $5,000 to $12,000. There are many different options available for those dealing with excess skin. Many people will meet with a surgeon a few times or seek a second opinion before choosing what procedure is right for them. The patient will have to go through a preoperative health check and blood work. The patient may also have bank their own blood for transfusions and avoid of all blood thinners prior to surgery. Some of the procedures involved may take multiple sessions to get the desired outcome, with several months allotted for healing between each procedure. People generally receive one to six treatments in order to get the results they were looking for. Many procedures are often performed by a team of surgeons in order to reduce the potential health risks to the patient and limit time in surgery. Excess abdominal skin is usually addressed by the following procedures: abdominoplastly, panniculectomy or a complete body lift. The procedures are performed with the patient under general anesthesia. More extensive procedures take place in the hospital, where the patient can be monitored closely and have a health care team nearby. In general the more extensive the surgery the greater the complication rates are. Excess skin removal surgery can lead to blood loss, hematoma, seroma and infection. It is important that the body’s temperature be kept above 35 degrees to prevent hypothermia which is a concern in major medical procedures. Deep vein thrombosis can also occur so wearing compression stockings and a low molecular weight heparin may be required. The recovery period from loose skin surgery is different depending on the individual. The scope of the surgery and the patient’s general health before the procedure will factor into the rate of healing. Most patients will remain in the hospital for one to two days. It is important for the patient to walk on the day of surgery to get the blood moving. Sutures are removed or dissolve naturally after a few days. Drains are usually removed two to three weeks after surgery. Many doctors will use compression garments to improve the long-term contour. There will be pain and swelling at first, but after a few weeks the swelling will dissipate. After the initial procedure the doctor will want to see the patient within one week to check on the healing process. If there is greater weight loss expected the doctor will discuss further treatment options. It is important to avoid heavy lifting and exercise so that the incision has time to heal. The length of time that the doctor will want to see the patient again depends on the scope of their surgery, but is generally around the six week mark. Make sure to call the doctor for any abnormal side effects due to the operation so that you can be evaluated.